First Solar, the solar panel maker with the Googlicious stock price, announced Friday afternoon that it had acquired a solar installer backed by media mogul and environmentalist Ted Turner. 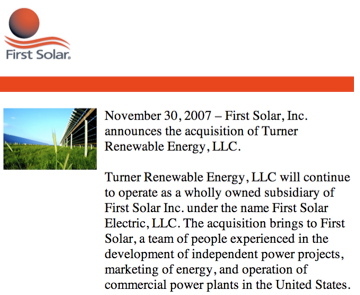 The price First Solar (FSLR) paid for Turner Renewable Energy — to be renamed First Solar Electric — was decidedly un-Google-like: a mere $34.3 million in stock and cash. But the deal is more important for what it says about the state of the solar industry. Increasingly, solar energy companies want to be able to deliver the complete package to customers. That means solar panel makers like First Solar — a Phoenix-based company whose largest shareholders are the Walton heirs — want to be able control and cash in on the booming market to install solar arrays on commercial and residential rooftops. Vertical integration, as they say. Silicon Valley solar cell maker SunPower (SPWR), for instance, bought solar installer PowerLight last year and has seen business grow as its panels appear everywhere from Palo Alto rooftops to Portuguese solar power plants. In China, meanwhile, solar company Trina Solar (TSL) makes silicon ingots, wafers, and modules. It recently announced it will begin producing its own polysilicon, the raw material of solar cells. First Solar: The Google of green tech? With the acquisition of Turner, First Solar also gets the financing relationships the company has forged that let it sell massive megawatt solar arrays to Fortune 500 firms. Turner, for examples, works with MMA Renewable Ventures (MMA) of San Francisco on deals. (Just this week SunPower announced the formation of a jointly owned holding company with Morgan Stanley (MS) to finance solar arrays for customers.) For Ted Turner, it was a fast turnaround — he made his investment in the company then known as DT Solar just last January. Panel makers that have not partnered with a finance company/installer (e.g. Sharp, GE, Evergreen, Sanyo) should look into purchasing/partnering with a company like Sun Edison. The days of the small solar company bidding on a commercial project look numbered. Every project going forward will be a power purchase agreement done by vertically integrated, large companies. Of course, the whole industry will wilt on the vine unless this Energy Bill is passed.